The couple connected several of the shipping containers, hollowing out the sides to form large, open living areas. “I’ve always been a loft guy,” says Mathesius. 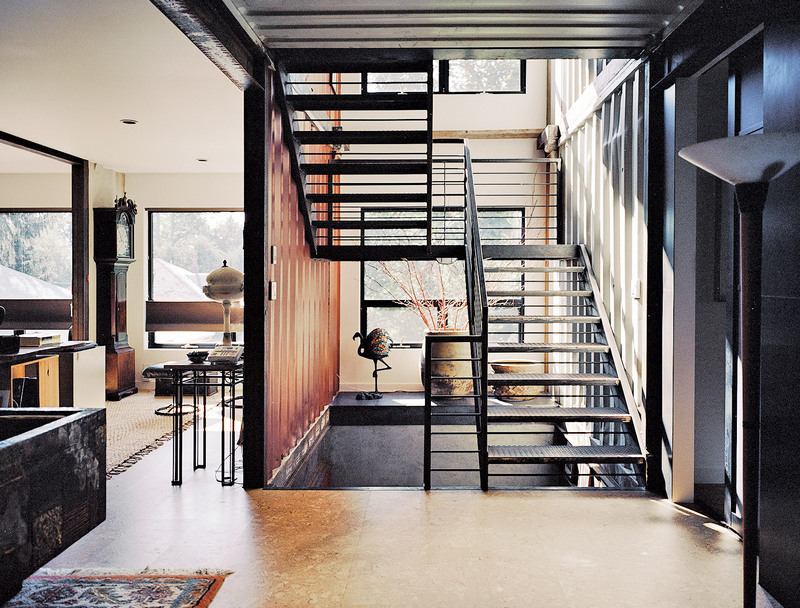 Embracing the industrial character of the corrugated steel material, he and Moseley applied the salvaged scraps as decorative siding for the hand-welded staircase. The custom kitchen boasts a suite of appliances by Miele and custom sliding doors and windows by Arcadia Architectural Series that open to views of the Delaware River, just across the street. In the master bedroom, a custom bed by Jason Micciche is outfitted with linens from Marimekko; the ceiling fan is by Fanimation. In Mathesius’s office on the third floor, an antique armchair, a rug, and a bookshelf made from salvaged wood create a cozy, sun-filled reading nook. 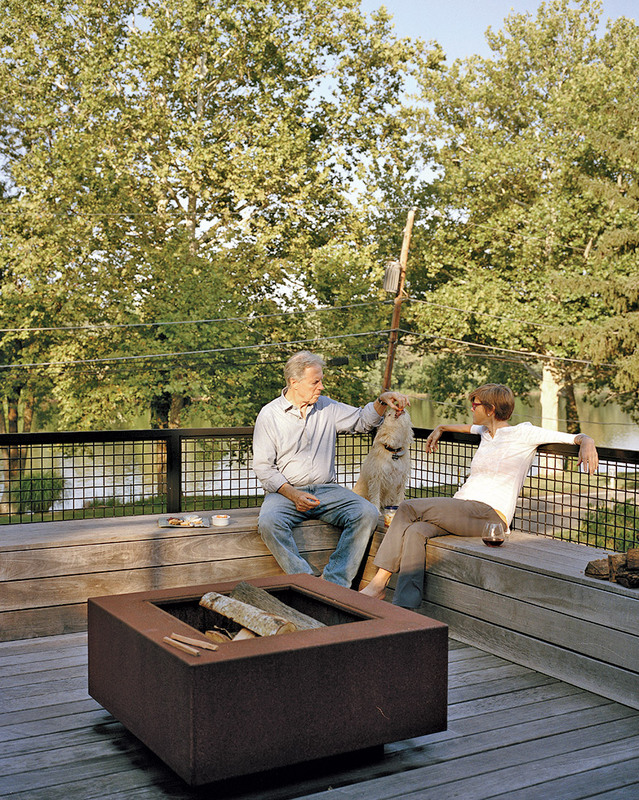 A mix of vintage finds and pieces designed by Mathesius, including a Cor-Ten steel fire pit on the second-floor deck, furnish a majority of the home. 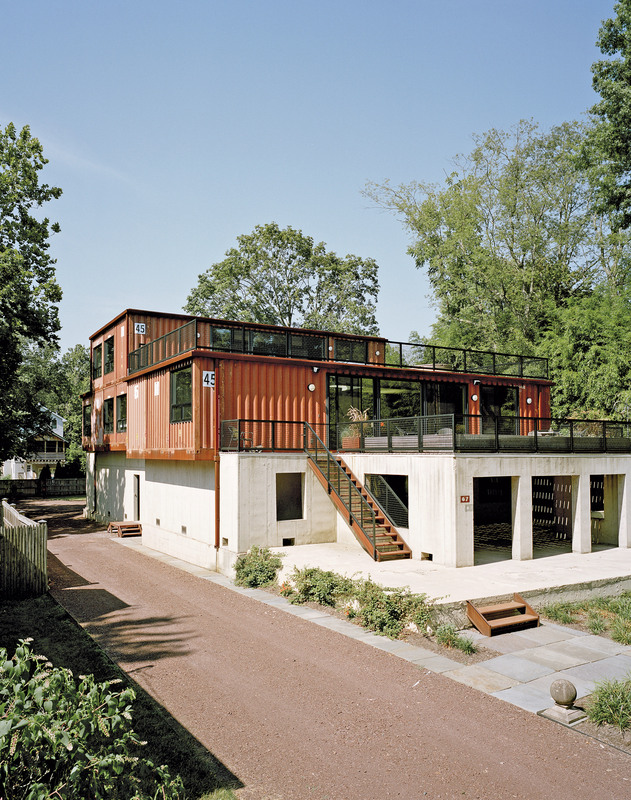 The structure consists of eight shipping containers on the second floor and three on the third floor. To meet the foundation’s slightly variable width, three of the containers were halved and pulled apart toward the front of the house, which also allowed for the insertion of a custom skylight in the main living space. Moseley notes the home’s distinctive staircase as one of her favorite features. “When the steel was ordered from the steelyard,” she says, “it was marked with our metalworker’s name, for easy pickup. That scribble still exists in random places in the staircase and is very industrial—we love it!” Hand-welded by Mike Carman, a local contractor, the staircase runs through all three floors, and it was custom-sized to fit the dimensions of the shipping containers, measuring nine-feet-six-inches tall and eight-feet wide. Just west of the New Jersey–Pennsylvania border, in the Bucks County borough of Yardley, across the street from the Delaware River, the home of Martha Moseley and Bill Mathesius sits on a sizable lot. Fashioned from 11 shipping containers and a preexisting raised-concrete foundation, the three-level, 7,200-square-foot structure stands in stark contrast to the neighboring vernacular of prewar summer cottages. 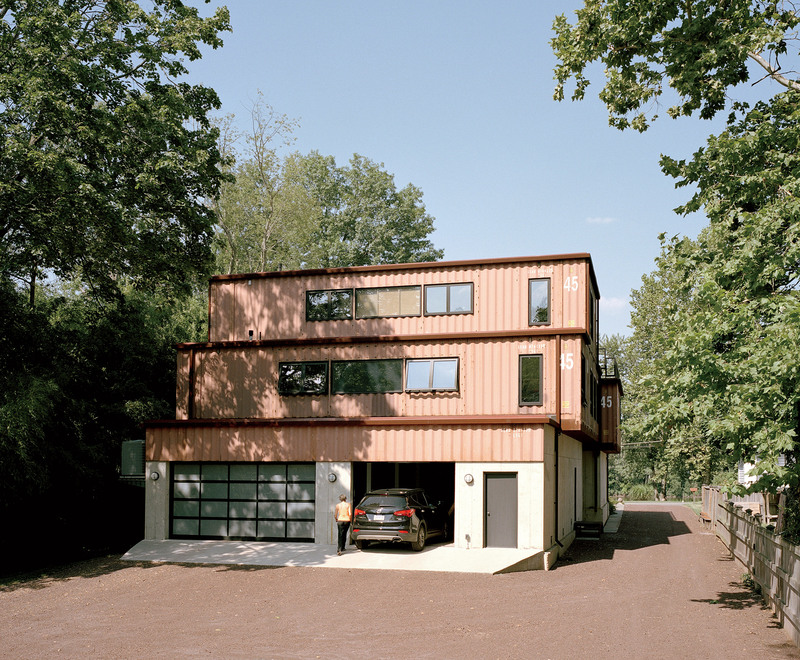 The couple were inspired to build using the distinctively industrial material upon realizing the length of the foundation—a botched, unrealized construction project of its previous owner—perfectly matched that of 45-foot-long containers. Mostly self-designed, and largely furnished with pieces designed by Mathesius himself, the structure is akin to a giant art project and manifestation of their personalities. We spoke with Moseley about the homegrown process of building the residence. Martha Moseley: There were little summer bungalows here in the ’30s and ’40s—that’s the way this community had developed. There was one here and it burned down, and so that owner decided to build a monster house. He put in all the concrete but abandoned the project. That’s part of what we purchased and very much what inspired us to build with shipping containers: this concrete foundation. It’s not just our primary residence, it’s our only residence. Bill and I had decided we wanted to relocate from our situations in New Jersey. We each owned there and decided to sell those properties and come here together. I was charged with finding something that had three things: It had to have a view; it needed to be in Pennsylvania; and it needed to be approximate to Trenton, New Jersey. Because of his position as a state superior court judge (and he was also the county executive of Mercer County in New Jersey), a lot of Bill’s world is still based around Trenton, which is only a few miles away. I started my search and found this site, which has a view, is in Pennsylvania, and is near Trenton. We came and looked at what was for sale—the concrete and the lot—and when I saw it, I recalled a magazine article on shipping-container homes. That inspired me and was sort of the catalyst. Then we did some homework and figured it out. We went to the Port Newark–Elizabeth Marine Terminal to pick out our containers—as with many things, you have to get a broker. The house is made out of 11 shipping containers, which run lengthwise, where the beams are; we covered most of the interior sides with Sheetrock. Each container measures 45 feet. Interestingly, this concrete structure that was already in place is just about 45 feet wide, too, which worked out perfectly for us. Bill and I pretty much did the whole interior layout. It was important to us, as we were designing it, to make sure we didn’t simply slot everything into a series of corridors. So this kitchen island configuration, which runs perpendicularly, is really a way to bridge the different units, take the focus away from the elongated container beams, and balance the overall structure. We were sensitive to making sure that we’d be able to achieve that, because we wanted it to feel open, like a loft. We were really lucky that for nearly all the decisions that had to be made, we would come to the same one without knowing it. One day, I brought a piece of paper home as a sample. I said, “This is what I want for the cabinets.” Funnily enough, Bill had found something that was nearly identical to it. The whole north-facing side of the house is planted with bamboo, which acts as a wonderful natural curtain. It actually belongs to the neighbor—we love it, and they love it, so it’s perfect. The bamboo grows so quickly that if you stood over it, you’d get harpooned! Since the bamboo provides a natural canopy, we have very few window treatments on this side of the house. The large windows are all custom-made. Our guest room, which we refer to as the sleeping nook, is exactly the width of a single container. You can see how, if we had decided to box things off, rather than cutting out each container wall, it would have felt fairly narrow—eight feet is not very wide. We painted the walls in this room but kept the original decals exposed and hung all the framed artwork with magnets. It’s rare that more than one of my kids will visit at a time, but when they do, they’ll sleep here—it’s the only extra room with any privacy. It’s closed off by these white bas-relief doors, designed by Bill. There are hardly any doors in the house, but there are also two shoji-style screen doors, also by Bill, which lead to the master bedroom. Most of the artwork in the house is Bill’s. He did all the sculptures, paintings, and photography, as well as the fire pit and the planter boxes on the patios, all made of Cor-Ten steel. Because we’re in a floodplain, we can’t have anything downstairs except storage and a garage—local zoning laws dictate that. So we keep all of our systems in a side room next to the guest room, and it’s all very, very compact. We have an on-demand water heater, radiant heat, and central air on both levels—though we hate air-conditioning, so we rarely have it on. We’ve got a ton of decks, one on each floor, and another right up alongside the water. The architecture’s not for everyone; I would say people are fascinated with it. When we purchased the lot, it was in such a state of disrepair that the neighbors were happy to see anything happen on the site. It’s an improvement to the space that’s of interest to everybody. The community has been such an amazing group of good, kind, thoughtful people everybody knows everyone and helps one another. We’re the only outsiders, and they’ve welcomed us.